General Overview Her mental Disposition: Unlike her Sister, she is quiet, but can be very mischievous and likes to pull pranks, but like all Somers she has a dirty and warped sense of humour, until she gets to know people, she is very shy and the exact opposite to Alexandria, in the past both have come close to blows, despite their attractive looks, both are tomboys and love a good scrap. Karyn has also trained in Klingon combat, its a family right of passage. But she has also mastered the Katana Blade both long and shortened versions, like Alexandria she is a quick learner when she is interested in something. Personal History Karyn Lynne Somers was born in the Eurasian Territories on Earth on Stardate 23rd August 2361, she has two older siblings, Her Brother John Lloyd Somers, who is a Fleet Technician at Utopia Planitia yards in Sol. Here elder Sister by two years Alexandria Lynne Somers is a Marine Captain on the USS Independence-A. Karyn followed the path of her sister, except where Alex got a field Commission, Karyn made Marine Sergeant on her own she has no one to owe a debt to. She also has no emotional baggage like her Sister, thus she has found Marine life easier to cope with. Karyn went to the same schools Alex did and like Alex passed high, she was offered the OCS test, but she was happy as an NCO. She has had boyfriends both human and alien, but for now, she is attached and liking it. Upon finding out where she was to be posted, she took advanced courses in certain combat areas. 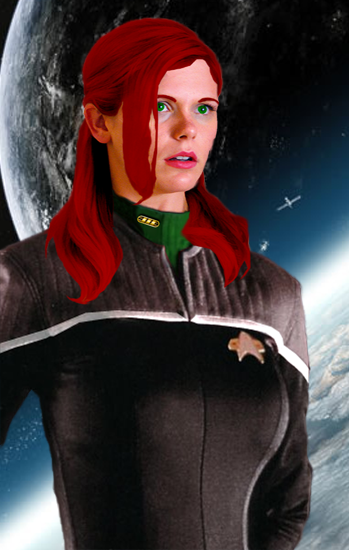 Karyn took part in a Starfleet Intelligence Undercover Operation not long after completing basic training, but the SF Intel Controller had been compromised, so Karyn's first stint undercover did not go well. If not for her unarmed combat ability she would have ended up a prisoner. But the events of this mission shook her badly and she has never reacted the same way since, so she tries to refrain from going on such missions. But when needs arise she does it, even if she is a little clumsy, her commitment to the mission she goes on is there.